The E8s truly wireless design frees you from cables so you can focus on the music while on the go and working on your fitness goals. Sound is excellent with deep bass from powerful drivers and AAC codec delivered via Bluetooth® wireless technology. Battery life is strong: charge up for three hours of listening and the carry-case will recharge the earphones twice before needing to charge the case. Voice access to smartphone assistants, hands-free calling, and music control come via buttons designed for easy convenience. The E8 works with an Android™ app that reads out notifications, a feature unique to Pioneer. But the difference is in the detail: unique L/R shapes, body-agnostic charging ports, textured silicon sleeves for grip, and LED battery indicator on the case. Light, practical, immersive, the E8 truly wireless headphones give you the freedom you need on the go. Say goodbye to cable hassle and annoying adapters. 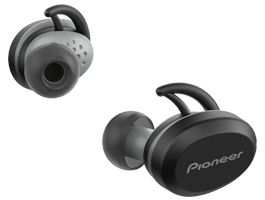 These true wireless earphones crafted by Pioneer brings great sound quality, convenience, and free movement, together in a light and comfortable headphone. 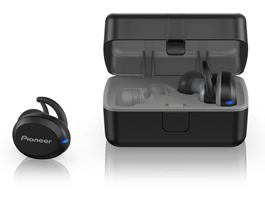 The E8 Truly Wireless Earphones are ideal for both indoor and outdoor use. They have been designed to keep you motivated, even during an unexpected rain shower or while you push through a hard workout session, thanks to their IPX5* rating. Beyond the sweat and water resistance, the E8’s come with three sizes of fins to hold them in place no matter how vigorous your activity. Also included are 3 sizes of ambient awareness ear tips. Perfect for running or cycling around traffic. The ambient awareness tips allow you to hear what is happening around you as well as listen to your favorite music. Pioneer Notification App for Android™ reads out notifications, such as e-mails, SMS, and messages so you can reply as soon as possible. This is great when you can’t reach your phone during exercise. The app also alerts you when your calendar updates, reads news headlines in real time, and much more. Stay wirelessly connected to phone conversations and smart assistants by voice. Simple buttons on the bodies activate a mic so you can make and receive calls. Or ask Siri or the Google Assistant for help without reaching for your phone. Strong rare-earth-magnet drivers give speed and punch to bass notes while presenting the audio image clearly and comfortably. Combined with the low-loss AAC codec, wireless music has more energy, with S/M/L-sized earphone tips assuring a deep seal with excellent comfort. Three hours of playback is perfect for most. Pop the earphones in the case and you’re good to go in one hour. The case recharges the E8s twice before needing to charge the case again. L/R earphones snap into either charging dock. The case has an LED showing battery life remaining when it’s tapped.